a. Dendrobium tetragonum var. melaleucaphilum occurs from central Queensland to the north coast of New South Wales. It grows in coastal areas, mostly on prickly paperbark trees. The sepals and tepals have red or brown markings. b. Dendrobium tetragonum var. tetragonum occurs from the Fitzroy River in central eastern Queensland to the Illawarra district of New South Wales at altitudes ranging from sea level to about 1000 m. It grows on paperbark trees near or in swamps and is commonly known as the ‘spider orchid’ because of the shape of its flowers, or as the ‘four-angled orchid’ from the shape of its four-sided pseudobulbs. The flowers are smaller than those of D. tetragonum var. melaleucaphilum and variable in colour; some have beautiful brown, red or purple margins. c. Dendrobium tetragonum var. cacatua is an eastern tropical variety that occurs at an altitude of about 700 m between the Fitzroy and Annan Rivers. The plant is similar to that of D. tetragonum var. tetragonum, but the flowers have no brown or red colour. d. Dendrobium tetragonum var. giganteum is a tropical variety found from north of the Fitzroy River to Cape York Peninsula. The plant and flowers are similar to (but larger than) those of D. tetragonum var. tetragonum. There is also a variety with a pink or ‘red’ labellum. 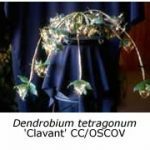 At this point I would like to recount the story of the discovery of the ‘red lip’ form of D. tetragonum var. giganteum as told to me by Sid Bachelor, who line-bred it to produce some most desirable cultivars. He told me that a school teacher, Mr. Bas Borger, who taught at a single-teacher school in a little town called Kookaburra, found the red lip form on the Carrai Plateau west of Kempsey. These orchids found their way to Noel Jupp, who crossed one called ‘Kennedy’s variety’ with another called ‘Barker’s variety’. Sid Bachelor bought six of these seedlings from Noel and managed to get two of them to breed. Some of the progeny had pink lips, so he tested them in his hybridising program and also used them for line breeding. One plant, D. tetragonum ‘Yondi #1’, turned out to be prepotent for the red labellum, producing a high percentage of red-lip hybrids. Furthermore the more he line-bred the more intense the red colour became. In the course of this discussion the red-lipped form of D. tetragonum will crop up time and again. D. speciosum X D. tetragonum = D. Hilda Poxon. 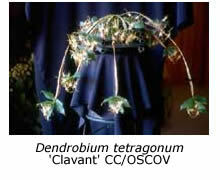 The most successful hybrids are those made with D. tetragonum var. giganteum, using either that with the normal labellum or that with the red lip. The flowers are large and star-shaped; some are plain yellow but the segments of others have beautiful dark red-brown markings. In the better cultivars each spike has up to twenty beautifully presented flowers. A large plant in full flower makes a spectacular display. A big plus for this grex is that the pseudobulbs may each flower twice a year for three or more consecutive years. D. Hilda Poxon is a noteworthy parent of hybrids such as D. Pauline Rankin, D. Mem. Bill Jefferies and D. Essie Banks. D. falcorostrum X D. tetragonum = D. Star of Gold. I don’t think any Australian native dendrobium collection is complete without at least one plant of D. Star of Gold, which has beautiful large star-shaped, golden yellow flowers with red markings and a pleasant fragrance. The spikes may be either upright or attractively pendulous. D. Star of Gold ‘Bathurst’ owned by Sid Bachelor is a very good parent. He has crossed it with many other species and hybrids and the results are eagerly awaited. I have crossed it with D. Colonial Surprise to make D. David’s Surprise, a large deep mauve hybrid with good show potential. D. kingianum X D. tetragonum = D. Ellen. In every collection and wherever there is a display of Australian native orchids there are bound to be several clones of this beautiful free-flowering hybrid. The flowers have the characteristic D. tetragonum shape. In the better hybrids five or more flowers are well displayed on upright spikes above the foliage. Each pseudobulb will flower for several years. A well grown plant will be covered with a profusion of flowers and will often be in contention for Best on Show. The combination of D. kingianum with the red-lip form of D. tetragonum var. giganteum has been very successful, giving such well known hybrids as D. Ellen ‘Boobyella’, D. Ellen ‘Lenna’ and D. Ellen ‘Deloraine’. All these cultivars have in turn become excellent parents. When line-bred with each other they have produced excellent cultivars of D. Ellen with large red labellums and lovely mauve to magenta markings on the other segments. I find those with distinct magenta markings on the segments most attractive. Some of the most notable hybrids produced using D. Ellen as a parent are D. Dot Sheen, D. Sofala, D. Warrambool, D. Lorikeet and D. Pinterry. D. Ellen X D. tetragonum = D. Aussie Ira. This hybrid has a ‘double dose’ of D. tetragonum and it therefore has a low flower count. Nevertheless it is a notable parent. A good clone of D. Aussie Ira is an essential tool in every hybridiser’s gene pool. Some of the progeny of D. Aussie Ira have become good parents in their own right. Examples include: D. Aussie Ira X D. falcorostrum (= D. Aussie Bonanza), D. Aussie Ira X D. speciosum ( = D. Aussie Starlight), D. Aussie Ira X D. Aussie Angel (= D. Colonial Surprise) and D. Aussie Ira X D. Sunglow (= D. Jesmond Dazzler). D. tetragonum X D. bigibbum = D. Pee Wee. D. bigibbum comes from the far north and is considered a ‘hot’ grower as are also D. discolor and some others. D. Pee Wee is arguably the most successful parent of the ‘hot/cold’ Australian dendrobiums and it has been the conduit for the introduction of the highly desirable features of D. bigibbum into these hybrids. D. bigibbum imparts its beautiful solid purple colour, wide labellum and well filled-in segments to its hybrids. The influence of the D. bigibbum genes remain dominant for several generations. When hybridised with cool-growing species and hybrids, the progeny can be grown in a covered bush-house in Melbourne without any heat. However it is then important to keep the plants rather dry during Winter. Some typical hybrids are: D. Pee Wee X D. speciosum (= D. Elegant Heart), D. Pee Wee X D. Star of Gold (= D. Elegant Sunset), D. Pee Wee X D. Hilda Poxon (= D. Brolga) and D. Pee Wee X D. fleckeri (= D. Tegan’s Delight). Conclusion. There is still much work to be done with Dendrobium tetragonum, particularly with the ‘red lip’ form. It is so attractive that one is tempted to use it often in hybridising. However, it is genetically dominant for the red lip and this dominance is often passed on to its hybrids. It is amazing how much we are attracted to the colour red – it seems to make an immediate impact, so that we overlook the softer colours. If caution is not exercised, it’s likely that white, yellow and marked labellums will become rare.